memoQfest 2018, held this year in Budapest from May 31 to June 1, was a great event as I noted in my recent discussion of how Kilgray – or rather "memoQ" as the company is now called – is on track with changes to the product and additions to its development and support teams in the broadest sense. This year, I spoke on some of the benefits of technology in general and memoQ technology in particular for translating specialists for law and finance. This was, in part, an abbreviated and updated version of my talk last year at the translation program in Buenos Aires University's law faculty and it is of course simply an overview of possibilities with some examples. This is a subject which could easily make up a full course for a semester or year, and in less than an hour one can only discuss a few bones of the concept, much less the full skeleton or the vital and varied body of modern practice. 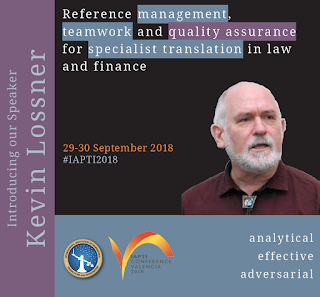 I'll be giving a similar talk at the end of this in Valencia, Spain at IAPTI's international conference this year, though from a little different perspective. I hope to meet some of you there. Getting independence right: as simple as ABC!